At Louis Interiors, we don’t just build beautiful custom furniture for your home or business. We let our clients become a part of the design process for every piece we make. If you have a particular look in mind, you can simply give as a photo, drawing, or simple sketch of what you have in mind. Our team will make your idea into a working design plan and then a finished piece that you will be proud of. To get you started with some ideas for what kind of furniture you would like to fill your space, we are offering a look at the newest furniture trends for spring 2016. New furniture pieces coming out this year are utilizing a variety of fabrics and textures. Colour is always a big component to work with, but texture is just as important. Any high-quality furniture manufacturer will offer a range of fabrics—including cotton, linen, satin, and leather. If you’re buying a new piece, consider whether changing up the texture might bring the space back to life. Pairing natural upholstery materials with animal patterned rugs creates a complementary look. Flowers are always representative of spring, but they have been out of favour on furniture in the past few years. Fortunately, this year floral patterns are making a comeback. They are a classic look that goes well with period-inspired furniture. But, you can also make flowers edgy and modern by choosing contrasting colours and prints with large blooms. Black and white floral patterns are another way to update this look for modern furniture. It can be difficult to pull together a completed look with floral furniture, so here’s a tip for tying together a room with floral fabrics. Find accents that also feature flowers. It can be as simple as keeping a vase with fresh flowers on the table or hanging a piece of art that features this colourful bit of nature. Deep, dramatic colours have been popular in modern rooms. And, that means furniture often plays the role of adding brightness to a room with dark walls or floor tiles. You can achieve this effect with metallic details like nail head trim on chairs or sofas, metal knobs and handles on wood furniture, and inlaid silver borders. And, it’s not only accents that can add shine to a room. Custom ottomans with a pearlized or metallic fabric finish work well in rooms with either light or dark colour schemes. In fact, you can get this metallic effect on any vinyl furniture. 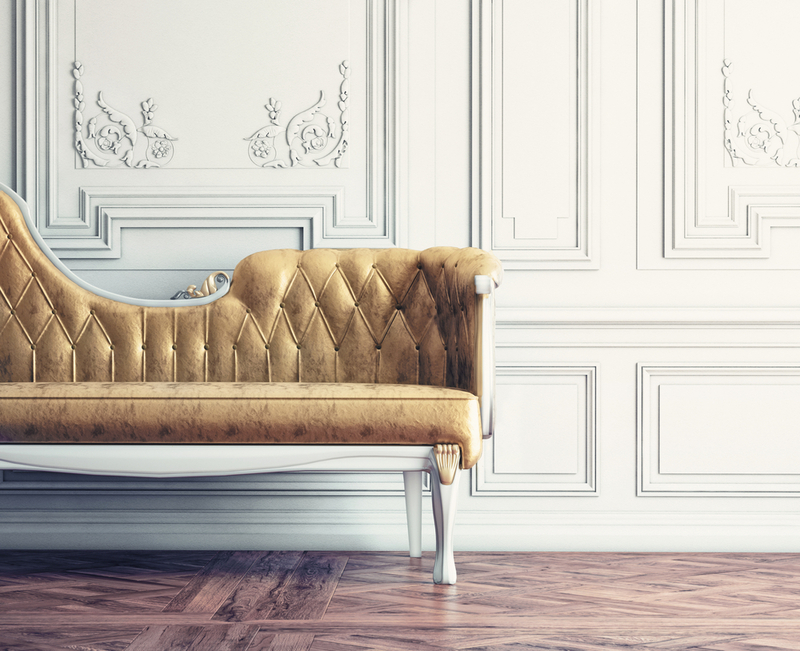 If you’re not afraid of bold trends, gold accents can lend an extravagant touch to metal furniture components. Many designers have been pairing it with black or navy as a contrast colour to add light to a dark palette, but it works equally well with white and neutrals. Gold is also being seen in fabrics this spring. Admittedly, this trend has been moving forward for a while now. But, the demand for handcrafted furniture continues to grow. People are simply recognizing that custom, handcrafted pieces are better equipped to stand the test of time and match any future trends you throw at them. For instance, when you buy a handcrafted, custom sofa from Louis Interiors, you are guaranteed to get expert craftsmanship built from a sustainable maple wood frame, among other frame options. If you get tired of the look, we are here to reupholster your piece in a new fabric or prepare custom accent pillows to refresh the appearance. The exposed parts of the frame will continue to look fabulous and resist mold, cracking, and warping. Buying local handcrafted furniture, like the pieces made by Louis Interiors in Toronto, keeps our local economy strong and provides you with unique pieces that can’t be found anywhere else in the world. Bring in your photo or drawing and get started designing your custom furniture pieces today.